A Turkish court has sentenced 40 people to life in prison for attempting to kill President Recep Tayyip Erdogan. Forty-six people were on trial for the alleged assassination plot during last year's failed military coup. The majority were ex-soldiers from the Turkish special forces, accused of launching an operation at the hotel where Mr Erdogan was on holiday. The high-profile verdicts are the latest in a series of trials involving hundreds of alleged participants. Exiled cleric Fetullah Gulen, who lives in the US, was among those on trial, but did not appear in court and no verdict was given in his case. Turkey accuses Mr Gulen of being behind the coup, and many of those who have been arrested or fired from their roles have been accused of being among his followers. The Gulen movement is now considered a terrorist organisation in Turkey. Mr Gulen, who lives in the US, denies any involvement in the failed July 2016 coup. Outside the court in Mulga, supporters of president Erdogan waved banners calling for the death sentence - which was abolished in Turkey in 2004 when the country was seeking admission to the EU. Mr Erdogan has raised the prospect of its re-introduction. 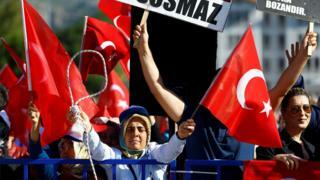 A key development on the night of the coup was the attempt to capture - or allegedly assassinate - Mr Erdogan, who was staying at a luxury hotel in the Marmaris resort, south-west Turkey. After a conspicuous absence for several hours, the president appeared live on television by videophone, saying he had narrowly escaped an attempt on his life. Within hours, he landed at Istanbul's Ataturk airport, demonstrating a level of government control over key infrastructure, and issued a rallying cry to resist the coup. Those accused of launching an attempt on Mr Erdogan's life were captured in the next two weeks. A Reuters reporter at the court said the accused were given the chance to make a final statement before verdicts were given. "From the moment I was arrested at the air base on July 16, I was treated like a criminal," one former lieutenant said. "Words don't mean anything here as we didn't have chance to a fair trial," another defendant said. "We are just the grass that elephants trampled on during their fight." Almost 250 people died in the attempted coup when heavily armed forces tried to capture the parliament building and overthrow the government. In its wake, thousands of police, ministry staff and academics were fired in a purge of state institutions, targeting those accused of opposing the state. Tens of thousands of people have been arrested, media outlets have been shut down, and journalists imprisoned. Turkey coup: What is Gulen movement and what does it want?